Greetings and Happy October! This was an exciting weekend for my family as one of our own got married! My niece, Faith Elizabeth wed her college sweetheart in an absolutely stunning outdoor wedding. 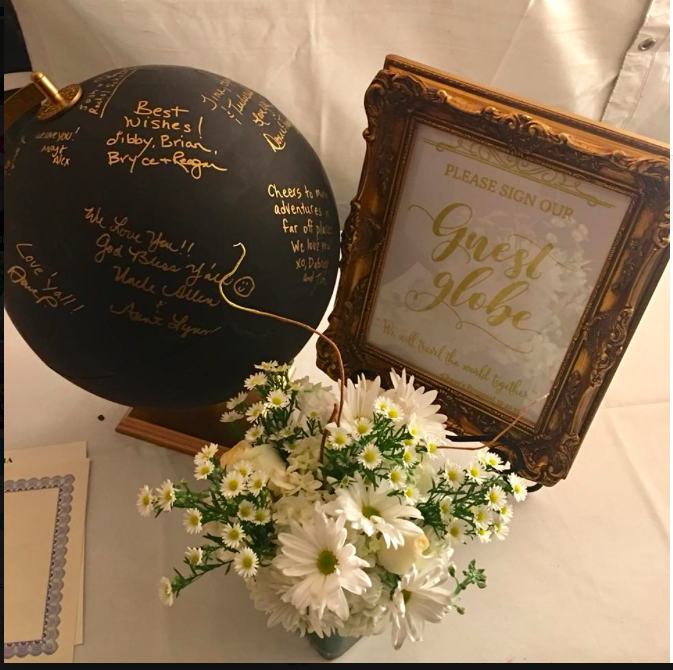 As their guest registry they had everyone sign a globe. Come see how easy it is to make a wedding globe! In case you missed it, I shared how to make a wedding globe last fall when my son got married. He and his wife love to travel. On the night he proposed he promised, “We will travel the world together.” So, it seemed fitting they use a globe as a guest registry! I found this globe at a consignment store for about $20. It’s neither vintage nor old, so I didn’t feel guilty about painting it. The globe comes off of the stand easily by removing the screw and pin from underneath. I painted the globe with a flat black chalk paint then reassembled the globe and stand. This entire project was quick and easy, and fairly inexpensive. I bought gold fine tip permanent markers to go with the globe. You can see the outlines of the raised continents and oceans but once the globe is covered in gold writing it blends in nicely. What a cute idea! You are so creative! !